We used to have a president who was so stupid that it was said that he could not walk and chew gum at the same time. Now, we have a president who is so stupid that he does not even know what a balance sheet is. This is proven by his right hand sycophant, Bruce Draney, who posted earlier today what he called a consolidated financial statement, but what he actually posted was a selective excerpt of a Statement of Revenues and Expenses. I agree that there are problems with this balance sheet. There some items which I would like to have explained. There are no footnotes. Also, there is the absence of an accountant's letter. I have never seen a published annual report that did not have an accountant's letter. 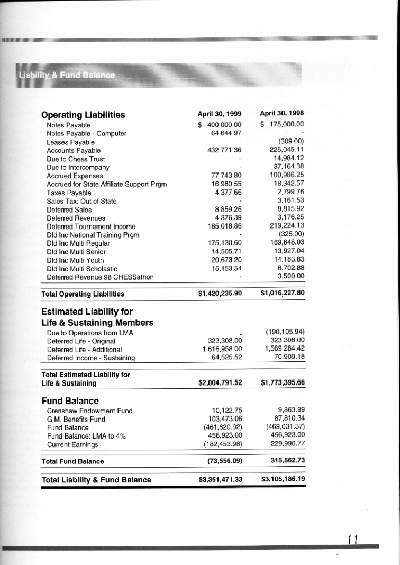 Still, there are financial figures and, except for the item entitled "Estimated Liability for Life & Sustaining Members", which is a long term liability, it appears that as of that date the USCF was basically in healthy financial condition, and probably better off than it had been in some previous years. 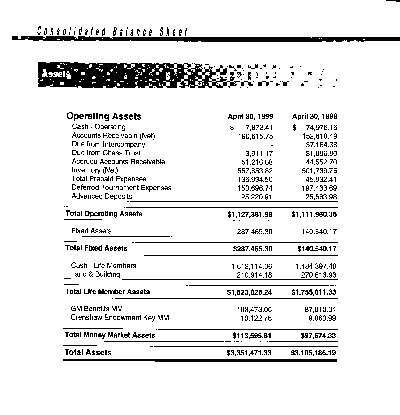 Unfortunately, this was the last financial statement issued. Nearly two years have passed since then. Nobody can claim to know what the financial condition of the USCF is now. The Redman Executive Board has shown no indication of any willingness to issue a current financial statement, assuming that Mr. Redman even finds out what one is. NOTE: To properly view this balance sheet in spreadsheet format, save this file to disk, cut off everything above the PRE tag and below the /PRE tag, and open using any spreadsheet program.